We have added new ECMWF Model Graphics. The model graphics are updated twice a day around 07Z/19Z. 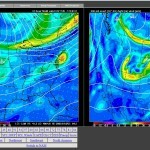 The link can be found on the home page under Forecast Models “ECMWF Hi-Res”. Below is the direct link. We also recently added a WRF ARW/NMM comparison animation feature. To view the side by side comparison of the WRF ARW/NMM model, select a WRF animation and below the animation there is a box called “WRF NMM/ARW Compare”. Select this and it will display the companion WRF model in the other screen for an easy comparison between the two models. We have recently added a new feature to the animation menus of the GFS and NAM models. At the bottom of the animation menu bar there is a place to select NAM/GFS Comparison and dProg/Dt. 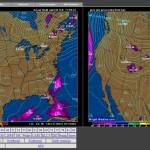 The model comparison allows you to have a side by side animation of the NAM and the GFS model for the same time periods. The dProg/Dt feature which is available on the NAM currently, allows you to compare the current model run to the previous model run, a 6 hour difference. We will be adding many more features in the coming months that will give the user more flexibility in the type of animations. Please feel free to provide us with feedback on what you would like to see. We added a background image to the NEXRAD single site imagery. We are looking into creating a better background image from topographic data. If this new image background is a problem, please let us know. The resolution of the GFS model graphics from 192-384 hours has been increased to 1° up from the 2.5º resolution. This will result in more detail in the extended ranges of the GFS. Note..The model itself has not had an increase in resolution, we are just now receiving higher resolution output.